Congressional candidate John Russell, a Democrat from Galena, gives a town hall meeting Feb. 1 inside a full Bayley Room of the Ohio Wesleyan University’s Beeghly Library. Russell has released an official campaign video on his website www.russellforohio.com (Facebook: John Russell for Ohio | Twitter: @russellforohio). Galena farmer John Russell concluded his Town Hall tour on Feb. 1, speaking to a full house in the Bayley Room of the Beeghly Library at Ohio Wesleyan University. This was a dig at former Republican Congressman Pat Tiberi, whose seat Russell is seeking. Tiberi, first elected in 2000, has left Congress to lead the Ohio Business Roundtable. Russell’s campaign team claims his town halls over the past two weeks in places such as Delaware, Clintonville, Mt. Gilead, Newark and Zanesville are more than Tiberi held in the last four years combined. 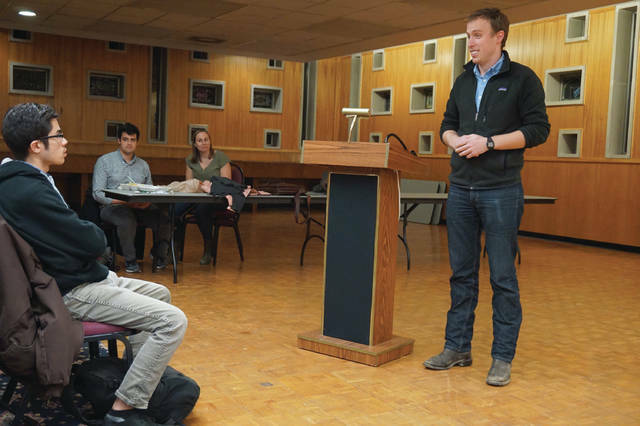 For about two hours, Russell fielded questions about his policies and strategy for winning in a district that is traditionally a Republican stronghold. Russell said the way the district is drawn up (see map) could pass for a work of modern art. “I want to fix the economy so that it helps everyone and drives out the influence of money,” Russell said. To that end, the Democrat said he would not accept any corporate money to fund his campaign, wanting only small-dollar donations from individuals. Among the positions Russell held: While acknowledging the health care system is broken, he wanted to protect the reforms of the Affordable Care Act and expand Medicare; said that he wasn’t “against all wars — I’m against dumb wars”; he wants to raise the minimum wage to $15 an hour; supported what he called the Republican ideas of a carbon fee and earned income tax credit; will be in touch with progressive groups such as Our Revolution and has received support from area Democrat Mary Jo Kilroy. “We are going to build a grassroots campaign where Democrats haven’t been in a long time,” Russell said. Originally from Wellsville, Ohio, Russell ran unsuccessfully in 2016 against Rick Carfagna (R-Genoa Township) for state representative in Ohio House District 68. However, Russell said he learned from the experience, riding a bike, and wearing out several pairs of shoes on his way to visit constituents, ultimately knocking on 30,000 doors. Russell said he was fine with being in a crowded field for the 12th District. According to Ballotpedia, the other Democratic primary candidates are Ed Albertson, Crystal Lett, Franklin County Recorder Danny O’Connor, John Peters, Franklin County Sheriff Zach Scott, and Doug Wilson. The Republican field consists of John Adams, State Sen. Kevin Bacon (Minerva Park), State Sen. Troy Balderson, Lawrence Cohen, Brandon Grisez, Jon Halverstadt, Tim Kane, Liberty Township Trustee Melanie Leneghan, and Delaware County Prosecutor Carol O’Brien. Also running is Independent Jonathan Veley. The candidate filing deadline is Feb. 7 with the primary election on May 8 (the last day to register is April 9), a special congressional general election on Aug. 7, and the general election on Nov. 6.